Celebrate and learn about local food in the school district and community at this FREE community BBQ! The evening will include delicious local foods, hands-on activities for children and families, farm animals, a corn shucking contest and more! This year's Nobel Peace Prize Forum will feature agricultural and food related programming, covering topics such as the New Green Revolution, Farmers as Peacemakers, and a Peace Meal and Art Festival. Support the Midtown Farmers Market at their annual fundraiser! Meet and mingle with neighbors, vendors and community leaders, enjoy tasty bites from Midtown Farmers Market vendors, Kabomelette Food Truck, Akshay Paatram, Red Wheat Bakery, and Fireroast Coffee and Wine Bar, plus a silent auction, and live music! Each ticket includes an omelette breakfast with fixins and coffee. Purchase tickets online, or stop by the market info booth during the Tuesday or Saturday markets to pick up a paper ticket. Grow North is thrilled to announce the launch of Food I Ag I Ideas Week - the Week will highlight and bring together diverse perspectives and communities to create a more visible and interconnected community for food and agriculture entrepreneurship and innovation. Panels, speakers, startup showcases and experiences will address industry-leading topics across sustainable agriculture, food innovation and tech, and food and society. Register to join Homegrown Minneapolis at a networking lunch on Tuesday, October 9. More Information and Registration for all Food I Ag I Ideas Week events. The City of Minneapolis provides community gardens in Minneapolis with low or no-cost compost. Qualifying community gardens may request one delivery of up to 10 cubic yards of compost. The amount of compost and the number of compost deliveries are limited, and not guaranteed. Compost and compost deliveries are provided on a first-come, first-serve basis. Community gardens that have never received compost, have poor soil quality, or are start-up gardens will get priority. Fall compost deliveries begin October 2nd and end November 1st. Fall compost requests must be submitted by September 21st by completing the compost request form. The MN Good Food Access Program is seeking community members to fill three Advisory Committee seats representing 1) a Community-Based, Food-Security Organization, 2) an Economic/Community Development Financial Institution, and 3) a Member At Large: Expertise in Economic Development, Health Equity, Finance, or Other Relevant Expertise. Seats are now open for applications via the Minnesota Secretary of State. 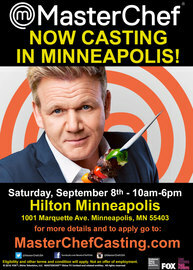 MasterChef Casting Call in Minneapolis this Saturday! MasterChef is on a nationwide search for talented amateur cooks from all types of backgrounds and with a range of cooking styles, to audition for Season 10. Whether you enjoy cooking delightful desserts or hefty main courses, whether you cook fine French cuisine or prefer a great tasting burger, MasterChef want to hear from you. "Like" the Friends of Homegrown Minneapolis Food Council on Facebook! Please contact Tamara Downs Schwei if you would like to suggest an item for the monthly Homegrown Newsletter. For reasonable accommodations or alternative formats please call 311. People who are deaf or hard of hearing can use a relay service by calling 612-673-3000. TTY users call 612-673-2157 or 612-673-2626. Para asistencia 612-673-2700 - Rau kev pab 612-673-2800 - Hadii aad Caawimaad u baahantahay 612-673-3500.